Oracle Korea labor union decided to go on a three-day strike from 16 to 18 May. It is the first labor dispute in 18 years for the employees of a foreign invested IT company in Korea to go on strike since the workers of Fujitsu Korea held an 18-day strike demanding the wage hike in 2000. The workers of Oracle Korea were driven to the corner to go on strike due to the wage freeze for long and the job insecurity caused by restructuring. The labor union said on May 15 that "As the company did not come up with any improvement measures on the wage increase and unfair personnel management system and job insecurity in the collective bargaining on the wages and working conditions, the labor union has no choice but to go on strike from 16 to 18 May." 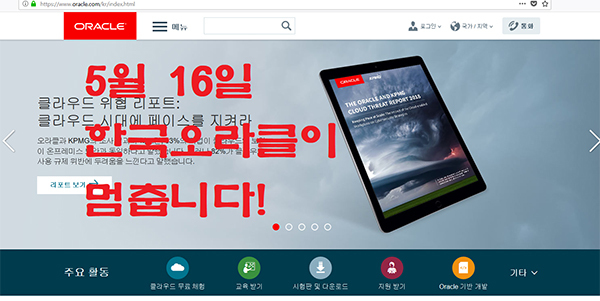 When Oracle Korea carried out the organizational reform and restructuring after it decided to introduce the cloud service in Korea, workers formed a labor union in September last year in protest against the company's decision. Last year, some 70 workers resigned due to the company's urge, which is a rapid increase in comparison with about 10 workers resigned in 2016. Oracle Korea did not show a cooperative attitude toward the union. When the union demanded a collective bargaining for the wage and collective agreement, the company insisted that the collective bargaining be held after the working hours and outside of the company. It took three months to begin the first round of the collective bargaining, but the negotiations fell through in April this year, five months after the negotiation started. The union has seen a dramatic increase of membership from three founding members to about 200 members on October 16, last year, only one day after the union 's launch. Of the total 1,200 employees of Oracle Korea, about 1,000 workers now joined the union as a result of recent membership boost of about 550 workers.